Find a new Jeep Renegade at your local Eau Claire, WI Jeep dealership. View NEW Jeep Renegade Inventory	Looking for a USED Jeep Renegade? Overview Want to get out and adventure more? 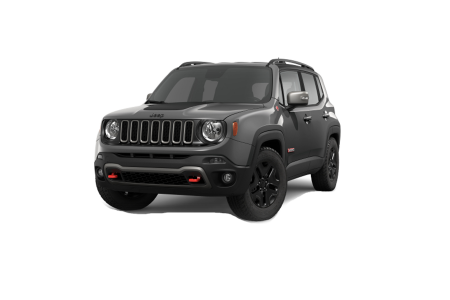 Add some renegade influence to your lifestyle when you buy or lease a new or pre-owned Jeep Renegade from Eau Claire Chrysler Dodge Jeep Ram in Eau Claire, Wisconsin. Choose from our fine selection of Jeep Renegade SUVs and realize that, yes, you can do it all when it comes to off-road exploration, spontaneous road trips, and daily commutes! Never say no to adventure, thanks to the powerful engine of the Jeep Renegade and its 4x4 system with seamless transition between two and four-wheel drive. Getting used to the capability of the Jeep Renegade SUV is easy. Just relax into its ultra-comfortable and easy-to-clean seating and let the rest take care of itself. To test drive the Jeep Renegade that off-road dreams are made of, stop by and see us on Mall Dr. near the Micon Cinema 7 in Eau Claire, WI today! Why Us? Here at Eau Claire Chrysler Dodge Jeep Ram in Eau Claire, WI, we love working with all kinds of customers, from first-time buyers to veteran experts. From the minute you walk in the door, our commitment to excellent customer service shines through. And because we know how big a task it can be to find the auto loan rate, auto financing program, or Jeep lease that works best for your budget, our dedicated auto financing team is here to help make the process smooth and easy. Want help getting a Jeep Renegade into your life in a way that makes sense for your financial situation? Give one of our friendly auto financing professionals a call or stop by and see us on your way home from work today. We look forward to getting you the Jeep SUV you want at the price you need. Thanks to our onsite tire center and auto service center in Eau Claire, WI, you can bring your car, truck, or SUV to Eau Claire Chrysler Dodge Jeep Ram for all your automotive repair and maintenance needs! When it comes to oil changes, transmission flushes, tire rotations, and more, taking your vehicle to an auto service center you trust is imperative. That's why all of our auto mechanics are highly skilled and specifically trained to work on any make or model of car, truck, or SUV. Schedule your next auto maintenance appointment with us online today and enjoy an auto service center you can trust. From early bird drop-off and Saturday service, to certified technicians and shuttle services, we've got everything your car needs and more!